Quitting Smoking and the Nuclear Strategy | The Better Plan . . I am curious what you think about this habit-breaking approach. Do you think this would be a good way to break a particularly difficult habit? And to my fellow choice theorists, how does this strategy complement or contradict the principles of choice theory? I picked up smoking when I studied abroad in Vietnam. The father of my host family didn’t speak English, but he smoked, so he encouraged me to join him. Open to new experiences, I went from zero to a pack a day in one week. That pack-a-day habit stuck with me for three years while I tried everything to quit smoking — set deadlines, cursed my lack of willpower, thought that switching to a tobacco pipe was somehow better. It was terrible. Of the hundred ways I tried to quit, here’s what worked: I set a date in advance that held meaning for me (the one year anniversary of graduating college), I wrote out a long list of both the things I hated about smoking, and the things I loved about smoking (so I knew the tradeoffs), and then — what I consider the innovative part — I hand-wrote fifteen letters to friends and family members saying “If, after May 20, 2001, I ever smoke another cigarette, I will pay you $200.” I sent these letter particularly to friends who themselves were smokers. When the date came, I gave away my remaining cigarettes, lighters and accessories. I scheduled new after-work activities to break up my routines for a couple of weeks. And I noticed a funny thing: my smoking friends, who had previously tried to lure me back to smoking in my earlier quitting attempts, were now constantly handing me cigarettes — then reminding me of the money I was going to pay them if I accepted the cigarette. 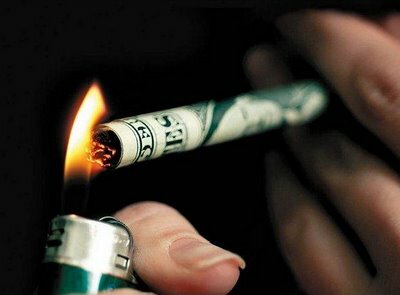 “This cigarette will cost you $200,” my friends would say. The letters had turned my enablers into enforcers. Needless to say, when that one cigarette would cost me $3000, it was easier to refuse it. And that was it. I still love smoking, and really wish I could smoke. But I went from a pack a day to zero, cold turkey on May 20, 2001 and haven’t smoked again. The blog went on to explain that a nuclear option is when there’s some major drawback to breaking a habit. For some people, it pointed out, this really helps. So what do you think? Is the nuclear option simply a gimmick? And if so, are gimmicks ever ok within the choice theory framework? Sage, succinct advice; pithy insights; encouraging phrases; brief formulas that crack the codes of life; maps that uncover the mysteries of understanding; and yes, shortcut links to The Better Plan blog posts. This is an interesting approach.. I can see how it helps to have additional accountability outside of yourself, but the most important aspect of it seems to be the personal desire to quit smoking, and that its important enough to do something drastic.. I think you nailed it. At first glance, it may appear that the guy is using external control on himself, which is not necessarily the best way to go, but as you analyze it a bit you can see how he arrives at a place, in his own mind, where he wants to do something, in this case quit smoking, and then he goes about setting up an accountability system that reflects the strength of his desire to quit. I am not recommending the nuclear approach for everyone, but the story does give us another angle from which to look at our choice power.